Because our official title is a bit of a mouthful, in the early days of the club, our name 'The Woodentops' was agreed and we have called ourselves that ever since. The club was formed by Mick Cuomo well before the end of the last century. With unending enthusiasm, Mick valiantly ran the club single-handed for many years; he managed accounts, handled publicity, wrote the newsletter and organised the Christmas party. He personally contacted new members and helped young and aspiring carvers - such as, in the early days, Bill Prickett - to develop their skills. When shows were held, it was Mick who persuaded the Mayor of Bromley to open them and when he saw celebrity chef Gary Rhodes eating in an Orpington restaurant, Mick had the nerve to interrupt his meal and ask him to come to our show, which he gladly did. He ended up buying a number of carvings as well as passing favourable comments on the bread pudding on offer - also made by Mick! In 2008 Mick handed the reins over to Tom Young who has led the Club ever since. A well as the monthly meetings, the club boasts a splinter group where select keener members meet weekly to practise their art. This time is needed because a proportion of our monthly club meetings - for some of us most of it - is not spent on carving, but swapping tips and hints, discussing carving matters and eating the delicious cake which is kindly provided by one of our club member's mother. We try to put on a show in our hall every two years or so. This is an opportunity for members to show off their work and attract new blood. We also support local events and in the past year or so have had stalls at the Kent County Show and at Bromley and Orpington craft shows where we can share the joy of carving. We do all sorts of things to try to make our presence felt, for example committee members have spoken to groups such as Rotary and the WI about woodcarving. Having said this, most of our recent new members have been attracted by our website, which was created by committee member Norman Wilkins and we urge other clubs to develop websites of their own. Without a doubt we have found this to be the best way to attract new members, who nowadays look on the web in the first instance to find a club near them. Clive Nash writes a full-colour newsletter almost every month and this goes not only to regular club members but to postal members who live too far away to visit the branch regularly but still want to stay in touch. We try to persuade guest speakers to come to our meetings and we also use our own members to impart their skills. Peter Benson has talked to us about soap carving - great for safely starting youngsters on the road to carving - Maureen Hockley on photographing carvings, Bill Prickett on carving birds and our own expert Derek Tryhorn on sharpening tools. 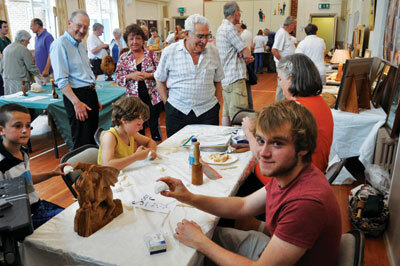 Leader Tom Young has also demonstrated carvingâ€™s sister art - woodturning. Derek Tryhorn also makes a point of helping those new to the club - some of whom love the idea of carving but simply have no idea where to start! He gives them simple projects and lends them tools. 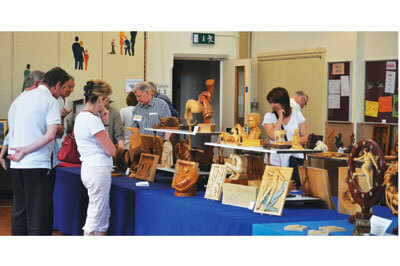 He is a skilled carving tool maker, which is to the benefit of many club members. The Club can boast its own celebrities of a sort. Apart from Roger Timms, the BWA national membership secretary, Peter Paces, the renowned international carver, shares his unique sense of humour with us as well as his championship carvings. Bill Prickett, a world-class animal and bird carver, also visits us from time to time. The Club goes from strength to strength but we are conscious that we must never rest on our laurels and are always looking to find new things to interest our current members and to encourage new ones as well. Our latest plan is a visit to the Ashley Iles carving tool factory in Lincolnshire and we will keep Woodcarving and its readers posted on our progress. 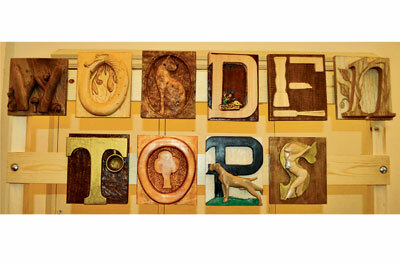 The Woodentops meet monthly on the first Saturday morning of each month. If you would like to know more about the Woodentops, or to become a member yourself, contact: St. Johns United Reformed Church Halls, Lynwood Grove, Orpington BR6 0BG.